Posted by dutchgrub	on Saturday, February 19, 2011 at 22:53. 6 Comments. dutchgrub is all about great food and we have done our share lashing out against restaurants that are beautifully styled and filled with trendy people but void of good food. So we were reluctant to publish a list of the trendiest restaurants in Amsterdam. But fear not. While listed for their trendy vibe, these restaurants certainly serve great food. And there’s obviously nothing wrong with looking cool! We’re starting the list off with three restaurants: Bistrot Neuf, De Kas and Hotel de Goudfazant. All three are certainly trendy, but each in a very distinct way. Bistrot Neuf is bustling and busy on hip Haarlemmerstraat in the center, De Kas is a tranquil beauty in a former greenhouse in a park in the east of Amsterdam, and Hotel de Goudfazant has created a cool industrial vibe in a former storage shed in Amsterdam Noord on the other side of the IJ. 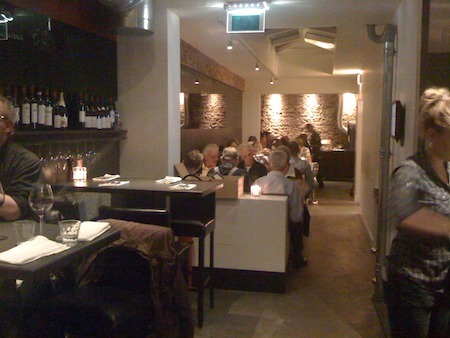 Bistrot Neuf has been hugely popular ever since it opened doors in early 2010. And for good reason. The location is prime, on hip Haarlemmerstraat with its fashionable boutiques and eclectic food shops and restaurants. The menu is classic French. The wine list, established in co-operation with neighboring wine store Chabrol, is quality yet accessible. And the three course prix fixe menu at € 29,= a sure winner. What we love about Bistrot Neuf is its bustle and busyness. It’s hard to get a reservation, the dining room is always full of diners and passers-by look in from the outside to admire the joyful inside. While decorated in a trendy way with bare brick walls and exposed pipes, Bistrot Neuf is also very cozy and traditional, with empty wine bottles everywhere and the daily specials written in chalk on a black board. 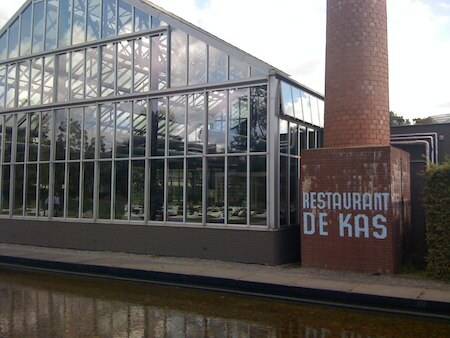 De Kas is a large restaurant and nursery, located in a former greenhouse on the outskirts of Amsterdam. The concept is based on serving only food produced on associated farms around Amsterdam. There is an annex with an herb garden that you can visit in between courses. The food is a healthy and organic 3 course fixed menu, prepared meticulously and presented with lots of attention to detail by the attentive service. We love De Kas for its incredibly beautiful and spacious feel. They do a great job making the diners feel connected to the ingredients and combining urban chic with artisanal tradition. Taking the tram more than a few stops from the center, walking into the nursery gives you a sense of calm that will make you enjoy the home grown food all the more. Open Monday to Saturday 6:30pm to 10pm. Closed on Sundays. Open for lunch Monday to Friday 12pm to 2pm. 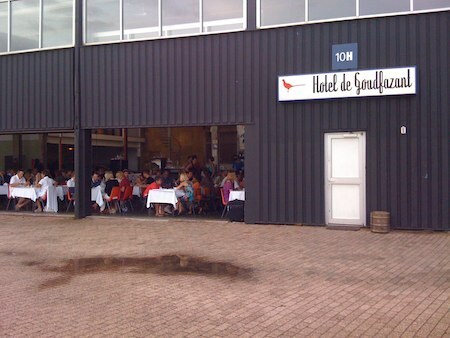 Hotel de Goudfazant is not easy to find. Having crossed the IJ, you will have to navigate through a slightly decrepit industrial area, follow smallish signs to a large parking area with a number of sheds and garages. The shed that houses de Goudfazant has very much been left in its original state with wide shutters that can be opened, heavy duty lifts and industrial heaters all visible, and walls and steel beams uncovered. The cuisine at De Goudfazant is distinctly French and the menu a reasonably priced three course prix fixe at € 30,50. We go to Hotel De Goudfazant for its rugged exterior and minimalist modern interior with long tables, plastic chairs and an enormous chandelier suspended from the ceiling. While many Amsterdammers avoid crossing the IJ to the northern part as much as possible, De Goudfazant has managed to establish itself as one of the go-to places for great food in a special setting. I’m heading to Amsterdam next month and have just discovered your blog, and I’m going to use as a starting point for my trip. I’m staying in Jordaan, are there any other places you haven’t reviewed that you’d recommend? There’s a list of restaurants by neighborhood here: http://dutchgrub.com/dutchgrubs-recommended-amsterdam-restaurants/. You can easily find lots of places I recommend in the Jordaan there. There’s indeed a lot more. The Jordaan is very popular and full of restaurants, bars and cafés. Anything in particular you’re looking for? What about Lion Noir? Pretty trendy I’d say, not? Had dinner there a few months ago. A few slip ups from the maitre d’ (reserved a table for 8pm but on arrival we were told our table wasn’t ready, took about 20min before table was ready…) but foh staff were friendly, professional and attentive. The food was pretty good, not too fussy and/or chefy. Despite being trendy I don’t think it’s one of those style-over-substance restaurants. I haven’t been to Lion Noir yet. Must admit I wasn’t super interested given location and menu. How did you like the food?